My last post was my pre-race post, and now I’m returning from the other side of the finish line. 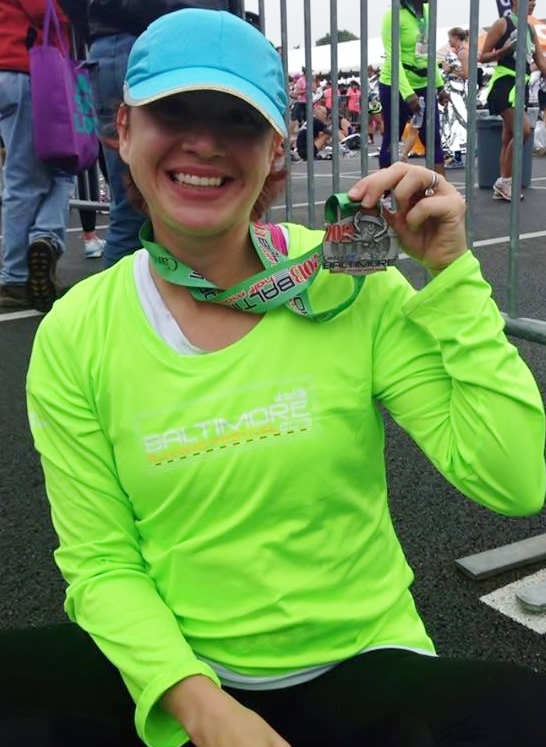 I took on the Baltimore Half Marathon, and I won. So of course, I said, “Heck yeah I won!” Finishing the race is winning the race, at least in my book. 5:00 am – 10:04: OH MY GOD CAN WE JUST GET THIS THING STARTED ALREADY?! 10:05: CRAP, it’s actually starting! 10:06: I think I need to go to the bathroom. Mile 2: I’m passing people! This is awesome! People are being passed by me! I am so FAST. If I were a Pony, I’d be Rainbow Dash. What I mean is, I basically have wings on my back. Mile 3: I’m really concerned about this whole bathroom thing. What if I really have to go? What if I pee myself? What if I get trampled trying to cross to the side of the course where the porta-potties are? Mile 4: Ha! Look at that sign! It says, “Smile if you peed a little!” That’s so funny! Wait — I was smiling but that doesn’t mean anything. IT DOESN’T MEAN ANYTHING! Mile 4.5: I love Baltimore so much! Yeah, we may be running through streets I’d be kind of scared to walk through during the daytime, but where else does the homeless population come out to cheer on their city’s runners? You guys ROOOCK! Mile 5: Oh, a hill. This isn’t so bad. I don’t know what people were talking about when they said there were some bad hills in this course. Miles 5.5 – 7: OH GOD IN HEAVEN WHY? WHY DID YOU CREATE HILLS? IT’S BECAUSE YOU HATE ME, ISN’T IT? Admit it, the earth isn’t one continuous flat surface because YOU HATE ME! Mile 7: Ok, that wasn’t so bad. Mile 8: We’ve been running on a flat course for awhile now. It’s kind of boring. I like a little elevational variety in my runs. Variety is a good thing. Mile 9: Seriously brain, did you just say you like “elevational variety.” I HATE you. Mile 10: Am I still running? I think I may have just fallen asleep. Maybe I was in the zone? Can I go back? Things are starting to hurt. Mile 11: I thought it was all supposed to be downhill after mile 7. This is NOT downhill. Mile 12.5: If my intestines explode before the finish line because I just drank a cup of liquid gluten I am going to HURT somebody. Mile 13: Where’s the finish like? Why can’t I see the finish line? Why are people WALKING this close to the end? Seriously people, I’m not stopping if I knock you down. Mile 13.1: I DID IT. I ACTUALLY DID IT! THE WHOLE WORLD IS WONDERFUL! I LOVE LIFE! I LOVE HILLS! I LOVE EVERYTHING! Now give me some water and my medal before I collapse. Like my glowing green goddess shirt? I do! Woo-hoo! Go, Krista! Congratulations! And great recap. I especially like mile 4.5. 😉 Now go get some rest! That’s MY GIRL that did this! I am so proud of you….never had a doubt in my mind that you could do it. By gosh, you can do anything you set your mind on! Thanks, Dad! 🙂 Baltimore is a great city– there wasn’t one part if the course that didn’t have people cheering for us. It was amazing. Woohoo!! I knew you would do it and I love that you did!